Tonight I went out with another homeowner to drop off flyers about the recent buglaries and to keep an eye out for everyone. We walked around most homes – particularly the dark and obviously empty – to make sure no “two legged rats” were around. We didn’t get far before discovering one house with a broken window and a back door with shattered glass. We immediately reported this to the police and they came out to investigate. The police seemed very aware of the many recent burglaries in the area, and even said they caught 5 kids coming out of one house. But in that case the criminals were underage so they were quickly released to their parents! Apparently B&E (that’s breaking and entering, for those who don’t speak Cop) isn’t a big deal if you are underage. It’s obvious these kids are coming in groups and targeting homes when no one is there. This last home was completely dark, the motion light was not working, the security system was not in use and the next door neighbor said he hadn’t seen anyone there for about a week. That house was an easy target, and as I write this the resident still does not know they have been robbed because no one knows exactly who lives there or how to get in touch with them. If you are leaving your home for more than 24 hours, do yourself a favor and let your neighbors and the police know. Richmond City Police offers a free home watch service. Just visit the local precinct (We are 3rd precinct, Sector 313 located at 301 South Meadow Street, Richmond Virginia 23223). or download the form from this page. (They prefer a few weeks notice, so try to plan ahead.) And at least leave some lights on and activate your security system! ADT has plans for less than $30 a month. If your security system is not active and monitored it is useless. We must all do those things necessary to prevent crime. We tried for over 5 years to get street lights. Yes we will get them in the next 60 days installed as long as RRHA and the City fund the installation as promised. All of you were instructed to make sure your MOTION LIGHTS were operable. On each break-in or attempted break-in the Homeowner did not have their MOTION LIGHT in the on position; this is negligence. We have also found that some of you refuse to utilize your built-in home ALARM SYSTEMS BFE had installed in every home in Randolph West; this is negligence. However, we can not make any excuses for the criminals who would enter your homes with the intent to rob you or do harm to you. These people are not worthy of living period. Every Homeowner should stay alert wherever you live and also watch out for your neighbor too. The police are only going to come after you have been victimized, therefore, it is incumbent upon you to do the right thing. Most of you do not follow simple requests to keep your TRASH CANS pulled back to the concrete pad in front of your storage room for obvious reasons. When a neighborhood starts to look tacky and slummy, that neighborhood tends to invite the two legged RATS!!! All of you need to do better to protect your turf and do not despair when these awful things occur because of simple security measures neglected by you. We are living in tough times and there are those who want to take what you have rather than get a job to earn what they want. Over the past week there have been reports of attempted and successful break-ins in Randolph West. 1617 Jacquelin Street was broken into twice in recent days and there were attempted break-ins at 1700 Kemper Street and 1608 Lakeview Avenue. 1617 Jacquelin had 2 laptops and a Playstation stolen. The house was entered through a side window where the screen was cut and removed. The incidents occurred sometime during the night this past weekend (Nov 20 – 22). 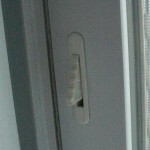 An extended window security tab. Everyone knows this, but you can’t be reminded enough – lock and bolt your doors. Lock your windows. Also, all windows in Randolph West have security tabs. Be sure they’re activated (extended) and your windows will not be able to be opened more than a few inches – even if someone breaks the glass. All homes in Randolph West have a built in security system, but it must be active and used properly to provide any protection. These systems can be activated and monitored by any security company (like ADT) and the cost is very minimal – $20 to $40 per month. Criminals don’t want to be seen when they’re trying to break into a home. Turn on your front and back porch lights and leave them on all night, every night. If every home in Randolph West keeps their lights on, break-ins will be reduced! New street lights and alley lights are on the way, but until then we must light up our area of Richmond. Criminals are more likely to break into a home when they know they have the chance at stealing something valuable. Keep all your blinds closed night and day so anything of value will be hidden from outside. And if your blinds are broken, replace them immediately. Broken blinds don’t just allow criminals to browse the merchandise, it also makes the neighborhood look bad. Simply taking the time to know who lives around you will allow you to know when someone around our homes is not supposed to be there. Stop and introduce yourself. Anytime there is any criminal activity we send out messages to the email list. Click here to join the email list here and you’ll know immediately if there are any incidents. We have a lot of renters in our area. If you rent in Ranoldph West (or anywhere else really), you’d be wise to have a renters insurance policy. They’re very inexpensive and will protect all your valuables. Check with car insurance company as they might provide even more discounts for having multiple policies. Call the Police. Call 911 or the Richmond Police non-emergency number 804-646-5100. Notify the Randolph West Homeowners Assoc. – info@randolphwesthoa.com – so we can get the message out to everyone. What Security Company Do You Use? I know a lot of people are using ADT. What security company are you using and what do you think of them? Posted: April 17th, 2009 | Author: Morgan Porter | Filed under: Discussions & Questions | Tags: ADT, Crime, home security, security | Comments Off on What Security Company Do You Use? An alert to all residents of the Randolph area! A home on Kemper Street was burgalarized recently. Apparently there was a TV stolen from the residence. If you have any more information on this incident please post it here (use the comment feature below). I got a call earlier this week from Joe Alexander. He told me that at 2AM on Saturday morning he noticed someone on my back porch. He asked the man what he was doing, knowing the person did not belong there, and the man said something like his aunt lived at my house. Joe told the man to leave and called the police but they obviously did not arrive in time. This was obviously the man who later came back to break into the home on Kemper Street. Thank you Joe! I could have been the one missing a TV today (or who knows what else). Know your neighbors. You won’t know if someone suspicious is around if you don’t know who IS supposed to be there. Leave front and back porch lights ON all night. We don’t have enough street lights in Randolph West (don’t get me started on that) so the more light the better. Keep doors locked and blinds closed. Do not put product boxes outside. If someone sees a large screen TV box outside by the trash can, they already know whats in your house they can steal. Add more locks. Install additional locks beyond the standard locks to prevent people from kicking your doors in. Activate your security system. Every home in Randolph West has a built in security system. Activate it and put up signs letting everyone know you have a system and you’re using it. Even if you’re not – put up a sign anyway. Every house in Randolph should have a security sign posted. Posted: April 17th, 2009 | Author: Morgan Porter | Filed under: Crime, News | Tags: Crime | Comments Off on Burgalaries on the Rise!